To own a custom made airbus is lavishness swishing through the skies. It wasn’t very long ago when American inventor and businessman Bill Lear, founder of Lear Jet Corporation, added valuable private jets to the well-heeled personas’ collection of motors. Its novelty hasn’t exactly worn off. In fact, the industry has birthed supporting trades to feed into this indulgence. Jet Aviation in Basel is one such completion business that was launched in 1977 by founder Carl W Hirschmann and former general manager Elie Zelouf. To create interesting ateliers is the reason behind it; and today the company boasts of designing over 200 unique aircraft interiors for their elite clientele, each thoughtfully conceived to match the owner’s quirks and comforts. Elisabeth Harvey, head of the Jet Aviation Design Studio since 2009 furnishes these private cosmoses in functioning luxury. Adept with luxurious interior designing of high-end residences, she speaks about creating a cabin interior in a VIP private aircraft as arguably one of the most exciting design challenges. What are the nuances for luxury in air? One of the most challenging aspects of an aircraft interior design is developing an interior which is beautiful, yet ergonomically sound; is technically feasible and meets aviation authorities’ full requirements of safety and certification. It must also be an interior which fully meets the needs of its owner. No two aircrafts are the same, which means that we build a unique prototype each time. Safety of the passengers is of prime importance, whether that is related to the design of the seats, which although luxurious, have their basis in a certified structure, or the treatment of materials to ensure that flammability requirements are met. What kinds of amenities are typical to private jets? They have truly VIP interiors with bathrooms, showers, lounge areas, and sometimes even cinemas, depending upon our clients’ wishes. These areas need careful designing around the specifics of the airframe itself and the certification basis of the aircraft. How does one accommodate demands that may not be practical? One of the interesting challenges in aviation design is translating elements which one may find in a home or yacht, into the interior of an aircraft. Almost every client wishes to push the boundaries when it comes to the design and materials they want to see in their aircraft. In the world of private aviation, even seemingly innocent requests can often become a challenge from a technical or engineering standpoint. For instance, in the idea of a fireplace, we took inspiration from the home, using the latest technology in monitors where flames appear lifelike, embers crackle, in this way defining the space by creating appealing warmth. We have certainly completed some demanding projects, including relocating the staircase in a Boeing 747 aircraft, which allowed us to create a highly bespoke bedroom environment on the upper deck. What does the designing process entail? Many clients buy a brand new aircraft, which is delivered directly from the manufacturer. This means we have to meticulously design every detail, produced mostly by hand. It is the work of a true artisan. In parallel we also need to define closely with our client, all technical aspects of their aircraft – the functionality of the inflight entertainment they would like, the sound system, mood lighting, what type of communications system they wish for, and so on. Once we have established a baseline, we bring together concept ideas, floor plan layouts and sketches, to help the client visualise the aircraft’s final look. Highly photo-realistic computer generated renderings show each room with the finished proposed materials and designs. After several detailed discussions, once our client is happy, the design is frozen so we can start engineering and production. Our job as designers however does not stop there. We work closely with engineering and production professionals, ensuring there is no deviation from the original design. Every detail is considered, right up until the aircraft is re-delivered to its owner. Is there a visible evolution in designing of this nature? 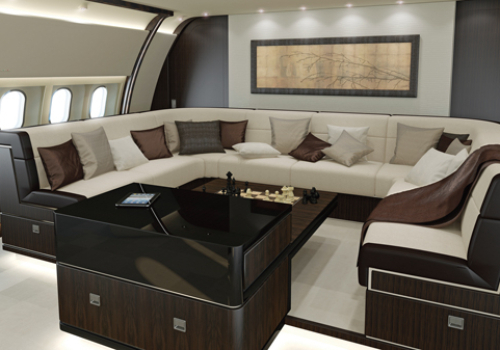 A particularly interesting trend which has been seen for some time now in private aviation is using the latest residential-based materials, amenities, and textures, even layouts in the cabin. Materials such as natural wood flooring and more open concept cabins, with buffet areas rather than galleys are often featured in our designs. We have installed gold leaf, rare woods, marquetry, marble, mother-of-pearl and other precious materials in our aircraft. Even materials or elements which were until fairly recently not often used in private aircraft, such as real glass mirror or custom designed lamps, are now almost standard in our VIP interiors.